Sorry it’s kind of blurry. Sunday I was good and wrapped presents and yesterday I mailed them off. I recently got a huge bag and box of fabric scraps from Jillian, who got them from Freecycle. 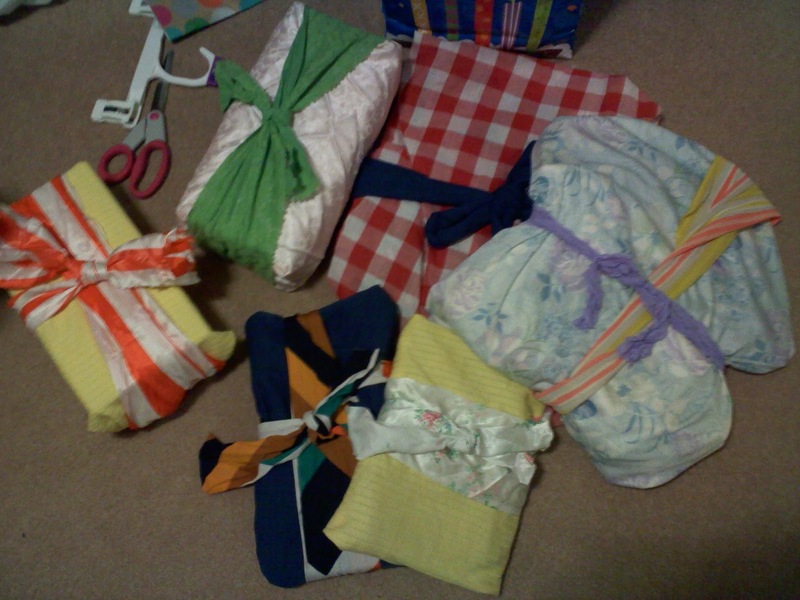 Instead of paper, I found large scraps and wrapped everything and then used stips of fabric for bows. Are they as perfect as paper-wrapped gifts? No. But I think they are prettier in their own way. I really enjoy doing different things like this around the holidays too. I know I’m not eco-perfect (but who is really?) but I feel like doing things differently in an unexpected way makes people think about something they hadn’t before. To explain that better….people don’t really notice reusable grocery bags anymore, they are so common. Same thing for Hybrid cars, organic food, metal water bottles. But gifts tend to look like gifts no matter where you are; wrapped in paper that hopefully gets recycled. I used to never think about wrapping paper. It was just something you have on hand and that’s what you wrap stuff with. The only time I’ve seen something different was how my oldest sister used to wrap gifts. She’d get brown butcher paper and get southwestern themed sponges and stamp the paper all over with paint. Then she’d use raffia instead of ribbon. I always thought it was really cool. I’m sure there are people who think my idea this year is really stupid and/or ugly. Whatever, that’s fine. I, for one, think it’s pretty spiffy and a good use of what I have on hand. This entry was posted in Uncategorized on November 30, 2010 by Erika T..
>Eating obscene amounts of delicious food. I ate so much it was painful. Everything was absolutely amazingly tasty. Yesterday I had some leftovers. Thanksgiving leftovers are my favorite kind of leftovers. My weigh in this week should be interesting. ugh. 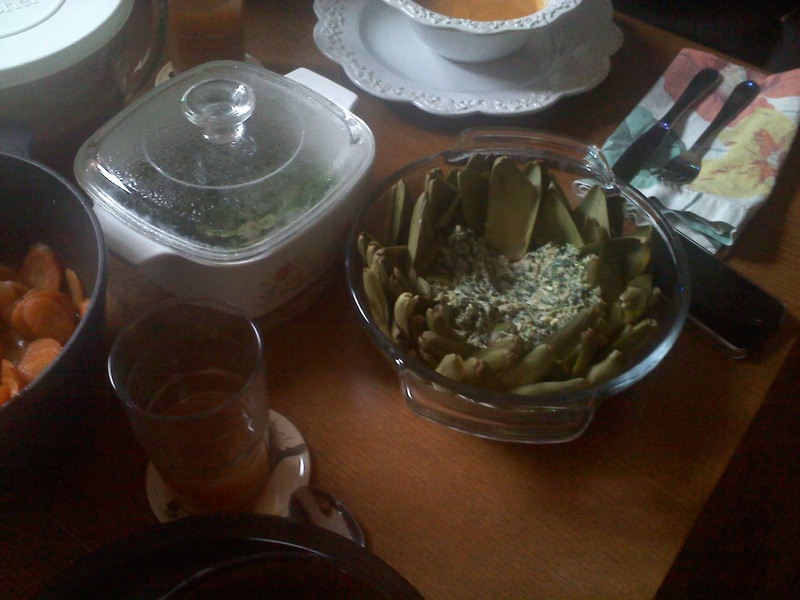 Carrots, green beans, soup, artichoke dip. This entry was posted in Uncategorized on November 28, 2010 by Erika T.. This is like the one I got but the wheel and pedal are painted a deep red. Yesterday I placed my order for my Hitchhiker spinning wheel. It’s a birthday gift from my dad. I spoke with the wife of the guy who makes these wheels. He runs The Merlin Tree and she was incredibly nice. I have wanted a wheel for some time now but they certainly aren’t cheap and I just wasn’t sure which kind I wanted. Some of the older, more traditional looking ones just didn’t seem like my style. When I was at the Southern Adirondack Fiber Festival I walked by some of these and they caught my eye. The design is really cool and they are very compact. When I started looking again recently I came across one of these and started looking into it more. I even looked at the Ravelry forum for people who use these wheels and it seemed like they only had good things to say. I also looked at YouTube videos of people setting them up and changing out pieces and it seemed very simple. Plus, it’s made out of basic parts so if anything ever breaks you only need to go to the hardware store to fix it. I also ordered directly through the guy who makes them, even though I may have been able to get one for a tad cheaper through a different seller. On the Ravelry forums he is the moderator and he seems very committed to customer service and making sure people are pleased with his wheels. This entry was posted in Uncategorized on November 24, 2010 by Erika T..
I’m pretty sure this has been the best birthday ever. I woke up to tons of birthday wishes on my Facebook page, then got to go to the Thanksgiving service at church. It was wonderful. 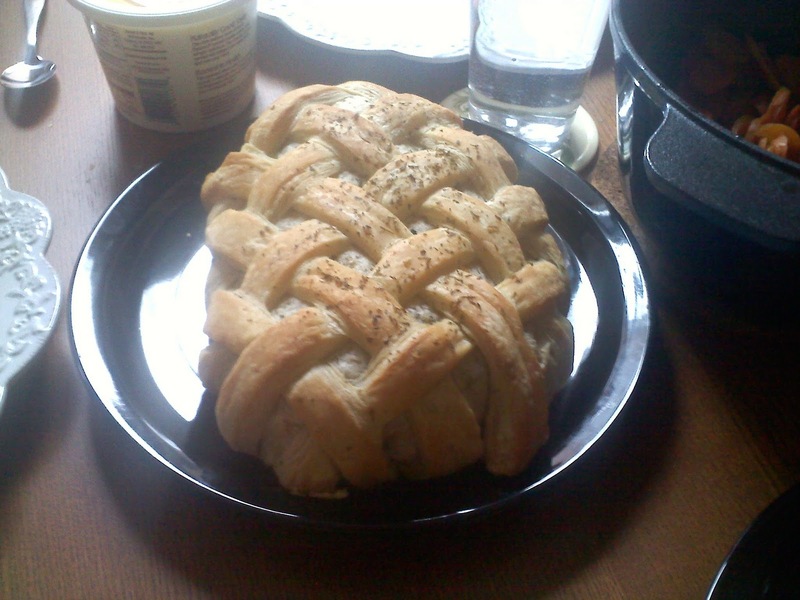 I had made African Krsa bread for the bread sharing part and Jack told me it was his favorite of all the breads. 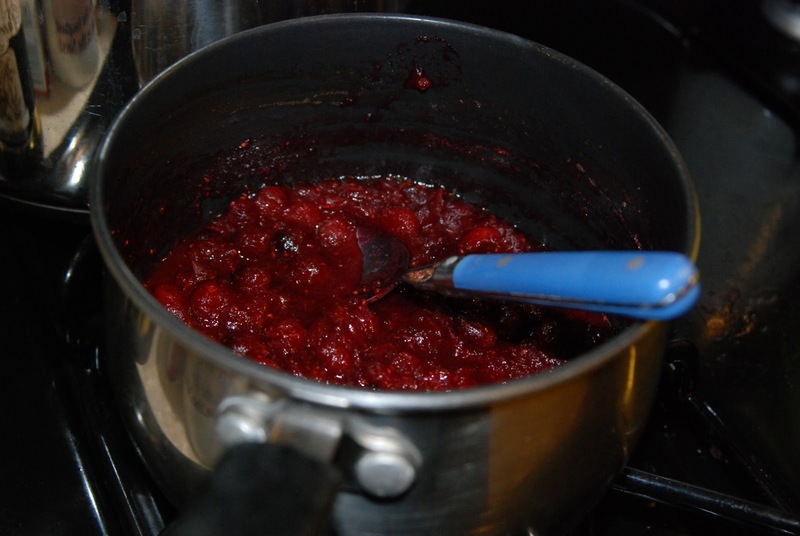 While there, Jillian gave me some of her strawberry preserves. They were from a batch that came out too runny so she said it’s really good on ice cream and pancakes. Since Jack is off Wednesday, I’m going to make homemade waffles and put this on it. I can hardly wait! 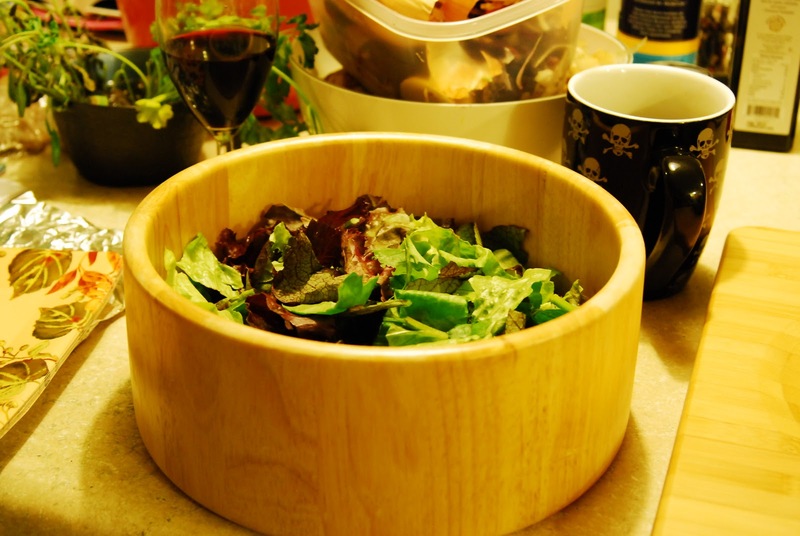 Then we went home and I made some yummy food from the market leftovers. HMF came over with her family and gave me a crocheted cowl (which is beautiful and warm and soft) and homemade vegan maple cupcakes. They are so good I ate two within one hour. Tonight I had practice, which is always a good time. Tomorrow I get to order a spinning wheel (a gift from my dad) and Tuesday I am treating myself to a facial with a coupon I got from the place that did my makeup for the wedding. Chris and Jack also bought me flowers yesterday so I’ll get to enjoy those all week. There is no greater feeling than the love of so many people all on one day! This entry was posted in Uncategorized on November 22, 2010 by Erika T..
>This Is What We Like To Call A "Recap"
Sweet potatoes in front with roasted root veg in the back. So it’s been some time since I’ve occupied this space. My parents came from Arizona so obviously I had to spend 2 days cleaning and organizing my house and then I was busy hanging out with them. All of us (me, the boy, and my parents) have birthdays this month. Chris’ is next month. So we got to go to Max London’s for a birthday dinner that was out of this world. This place is my most favorite restaurant ever. Everything is so delicious. They gave us our Christmas present early too, which is a gift certificate for there. You bet we’ll be back in a month. 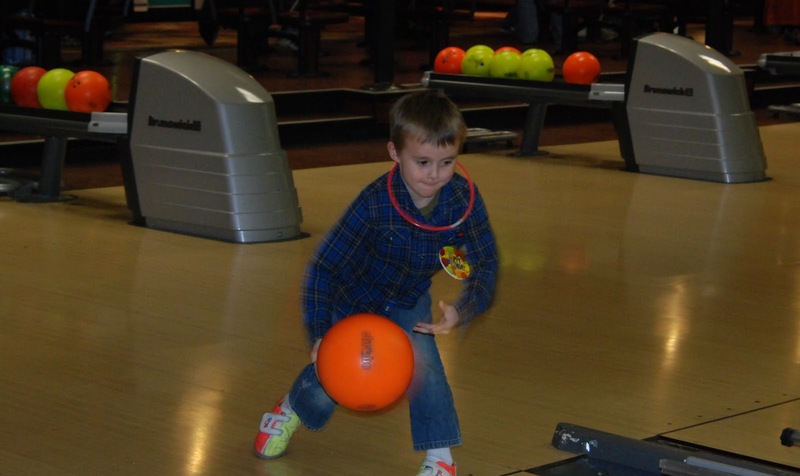 Jack also had his birthday party, a bowling party. He’s actually pretty good and we’ve pondered him joining a bowling league. I think that would be so much fun. Bowling is much more our style. I can’t be a soccer mom. I require a sport where I can drink while watching/participating. Now that boy is up to his eyeballs in Legos, and Star Wars and all sorts of crazy things. I made his cake with this recipe and this decorative frosting, and it was so incredibly easy and both are vegan too. 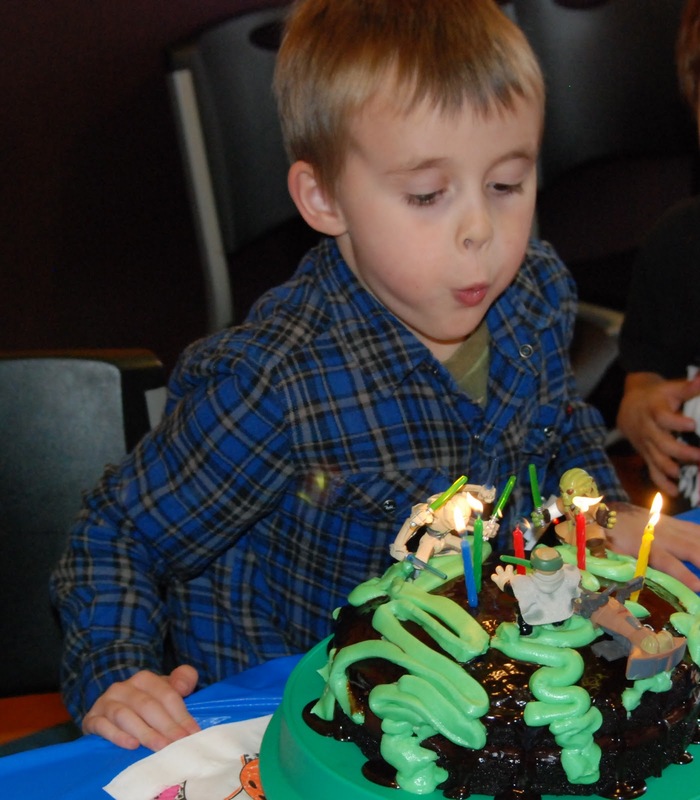 I should note this is his 3rd birthday in a row with a Star Wars cake. I think if he keeps the trend until he’s 18 George Lucas should show up and give him a college scholarship. There is an epic battle happening on that cake. 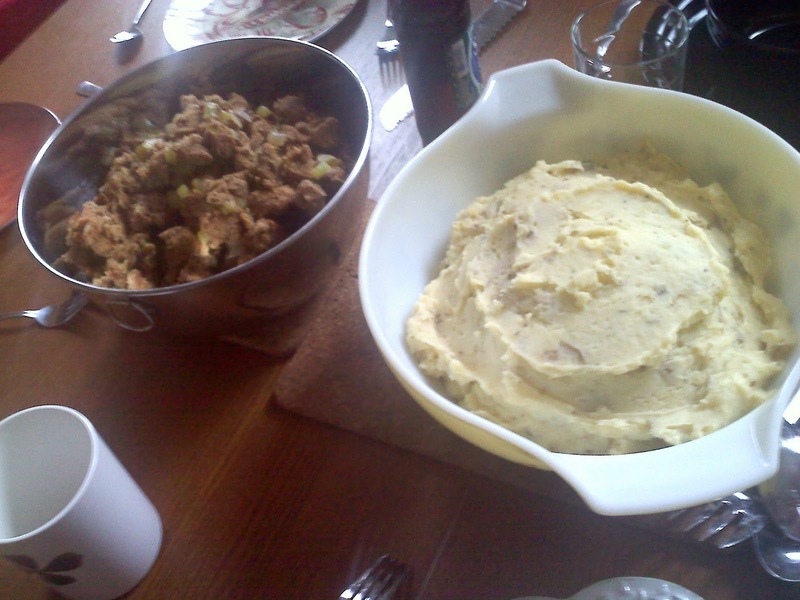 We also had Thanksgiving. We couldn’t get a turkey though because none had been slaughtered yet. Such is life when you don’t buy meat at the grocery store. As a sidenote, we realized at the market today no one ever has turkeys this time of year there. I smell a future venture here! Local greens with apples from Saratoga Apple, homemade vinegarette and candied walnuts. 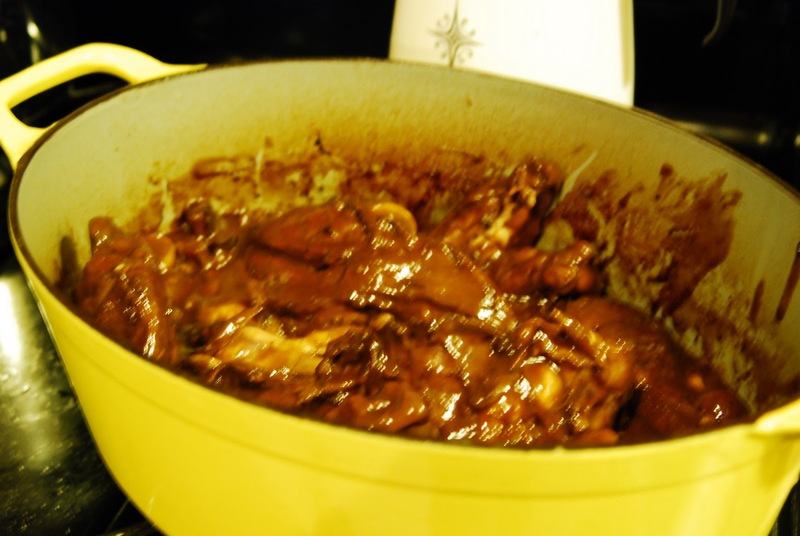 Coq Au Vin in the best pot known to mankind-Le Cruset! Instead, we got a monster chicken from Brookside Farms and Chris made Julia Child’s Coq Au Vin. It was incredible, like always. I like having a husband that can build a door, repair a lawnmower and create French cuisine. 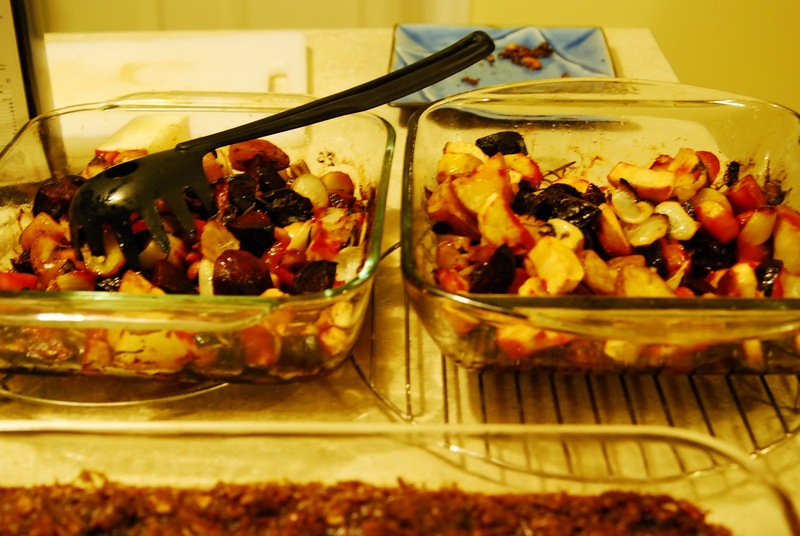 We also had roasted root vegetables, Chris’ parents’ sweet potato dish (which now my mom makes and has passed to my sister-in-law’s family as well), salad with apples and candied walnuts and homemade cranberry sauce. Don’t ever let me catch you with that canned garbage. Homemade is so easy and even Jack knows the canned stuff is blasphemy. -I made a crocheted cowl from my fab Seattle yarn. 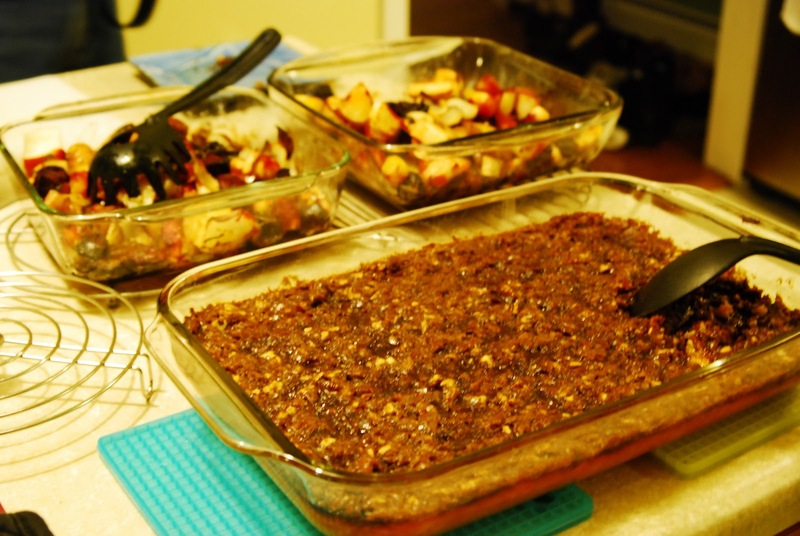 -And this week’s coming ThanksVegan with HMF and another family. -Oh, and my deep, sick obsession with PBS’ reality programming. This entry was posted in Uncategorized on November 21, 2010 by Erika T.. 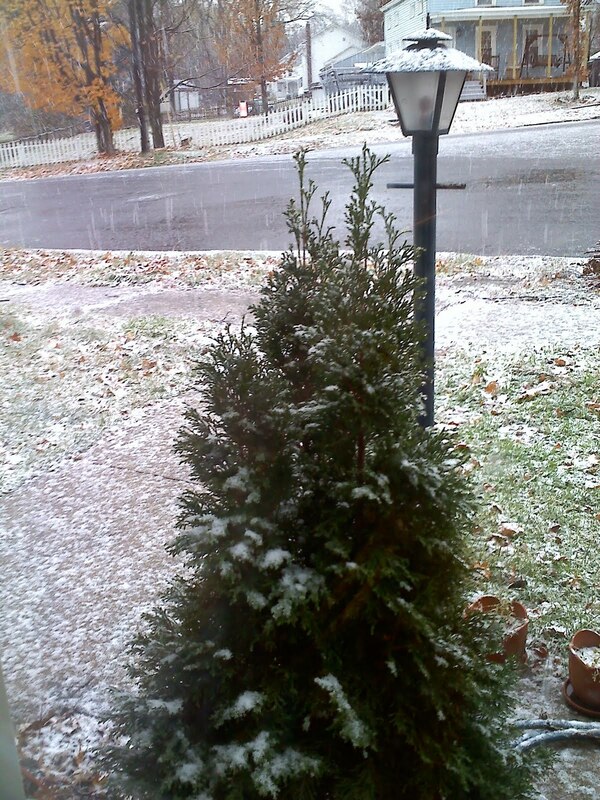 Yesterday was the first snow of the season. It melted today but it was really pretty yesterday. I ended up not going to practice (I heard the highway was bad, and I have a 45 minute drive each way) and instead I got out our vacuum sealer and a bunch of our dry food. 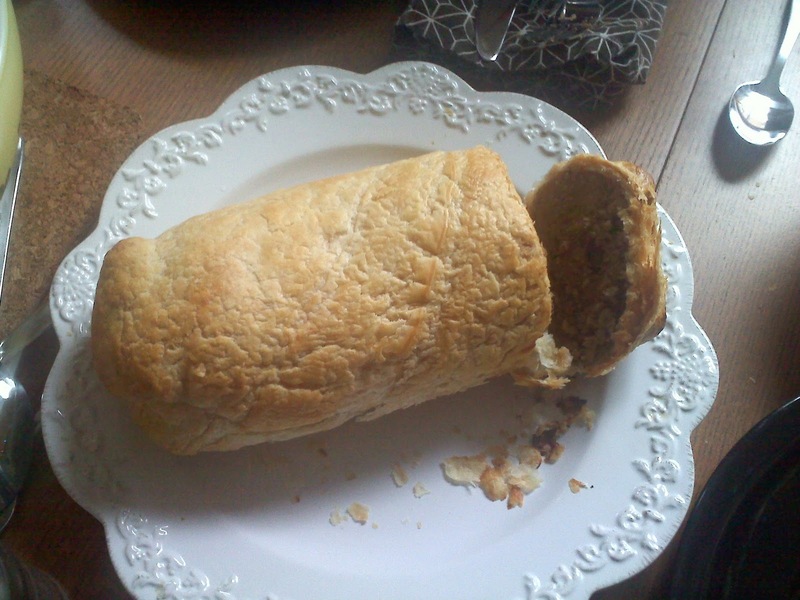 I sealed it all up with oxygen packs to preserve it longer. Then I put it all in our 5 gallon buckets with the gamma seal lids. Now I just need to restock the pantry where all of that stuff was. I’d been meaning to do this for some time, but the presence of snow was a good motivator to make sure we’re prepared for winter. Today I finished up a book (I’ve been on a reading spree lately, which is always good) and my brother’s beanie. I’ve also been drinking more tea and burrowing under my quilt on the couch with my hounds. Now I’m about to start working on a cowl/infinity scarf type thing for the impending super duper cold. My parents come into town tomorrow. This means that Thursday through Monday will be a nonstop food fest, which I’m totally ok with. Plus I get birthday presents! YAY! Fall really is the best. This entry was posted in Uncategorized on November 10, 2010 by Erika T.. Lately I’ve been thinking a lot about bartering because I’ve been doing a lot of it. I am really enjoying it. I remember learning about bartering in elementary school and always thought it sounded like a nifty idea. As I got older I found out that my step grandparents used to barter for all sorts of things when they had a farm. Here is how bartering is occurring in my life at the moment. Recently I’ve been writing the newsletter for the Kilpatricks that comes out each Friday. I can’t work for them at the market this winter (which is how I was going to pay for my veg) so since I do this, Michael trades me a share each week. I’m good at writing, he’s good at growing, it all works out. I am working with my neighbors though, and since the winter market is traditionally slower than the summer market, I’ve worked out a barter agreement with them. This Saturday I got all the left over potatoes (oh man are they good) and 18 homemade tortillas (which are addictive). Now I could make both of these but having them on hand saves me time. Plus I got a smoothie, burrito for me, burrito for Chris and some pesto mayo. So, to recap, for doing work for just two vendors at the market I get all of our produce for the week, plus fed at work and some other great food staples for the week. The past few days I’ve used this food and that means I’ve saved a trip to the store or a few hours in the afternoon cooking. I’ve traded other things, like bread for laundry soap, babysitting for sushi, and vegan birthday cake for the admiration of my derby team. Well, maybe that last one is pushing it… 🙂 A friend even held a clothing swap a few months back where I came home with tons of clothes and housewares without paying a penny. I really like bartering because money is very impersonal and sort of abstract, thus easily abused and distorted. With paper money you never feel like you are getting paid enough for a job, you never feel like you have enough, and you always feel like you have to spend more than you’d like. But when you trade something for something other than paper it changes how you view your time, skills, and relationships. Plus what would you do if you didn’t have money or money was worthless? Would you be scrappy enough to come by food? How would you get clothes for you and your kids? How would you get that thing in your house fixed that you have no clue how to fix yourself? Life and its needs keep on coming no matter what, and I’d rather have creative ways to deal with that. At the moment, if something terrible happened, I know all of our basic needs would be met just by the company I keep. I know I could shovel Chuck’s barn for milk/eggs/cheese, clean Mary Jane’s house for soap, and the list goes on. What’s one thing in your life you could barter for something you need? 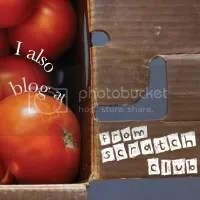 This entry was posted in Uncategorized on November 8, 2010 by Erika T..